Angela, Paul & Laura Giraudy - Homes by the Lake - Buying in the Area? Buying a home can be one of the largest financial investments you'll make in your lifetime. If you're a home buyer you'll find working with Angela & Paul Giraudy a refreshing experience. 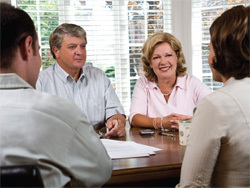 By seeking out the sound advice of a REALTOR®, you'll save time, energy, and money as they will help educate you on the home buying process. Before you begin searching for a home, make a detailed "wish list" of what you want and in a home. We’ll help you prioritize your list and will suggest features you may overlook. First, you need to decide where you want to live or the neighborhood you're going to call home. Location is just as important as the property you choose. Decide what you need in a neighborhood. Do you have children that are school age or will soon be? Are you single without a vehicle and using local transit? Are you downsizing from a large home in the suburbs? When you have determined your requirements, we can quickly source information about potential neighborhoods, pricing trends and community information and suggest areas that seem best suited to your requirements. Read about the local neighborhoods in Etobicoke Lakeshore in our Area (link) section. Second, think about the type of home you want, for example, condominium, townhouse or single family, new or resale, and the amount of space you need. Before you start looking for a home, we'll need to determine how much you can afford. The main home buying expenses include the down payment, the mortgage and the completion costs. Current interest rates will affect the amount you can afford. Most homebuyers will need a mortgage. Ask us to help calculate how much you're eligible to borrow based on your income and level of debt. You can also use our mortgage affordability calculator to determine how much you can afford.